Some say time is a flat circle. If that is so, the Indian Senior Women’s National Team seem to be on that spectrum. Though level on points, 6 each, Myanmar have a goal difference of +8, as compared to India’s +4 in the two matches played so far, which means it’s do-or-die for India. “We have always taken one match at a time. We will do so against Myanmar too. We are aware of the quality they possess. We will have to be on the top of our game if we are to secure qualification. We know what is at stake. 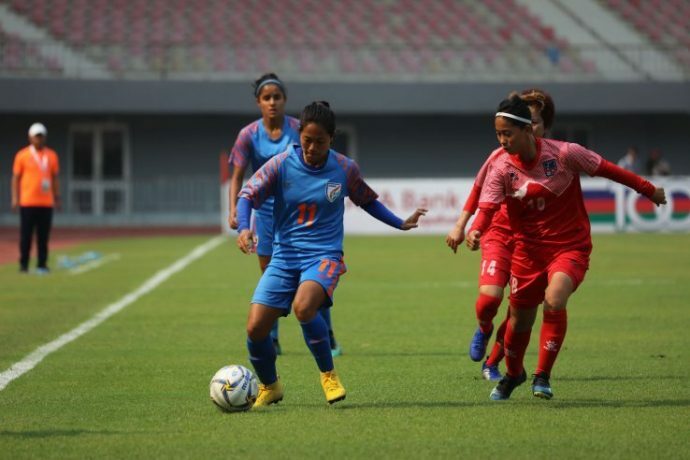 The next 90 minutes have the power to define women’s football back in India,” Maymol murmurs. She wasn’t the only one to pre-empt it. Rival Head Coach Win Thu Moe of Myanmar, also lauded the Indian team. History seems to favour Myanmar. The last two encounters have ended both in Myanmar’s favour, with Win Thu Moe’s team winning 2-1 in Olympic Qualifiers Round 1 in November 2018, and 2-0 in the Hero Gold Cup held in Bhubaneswar, Odisha.